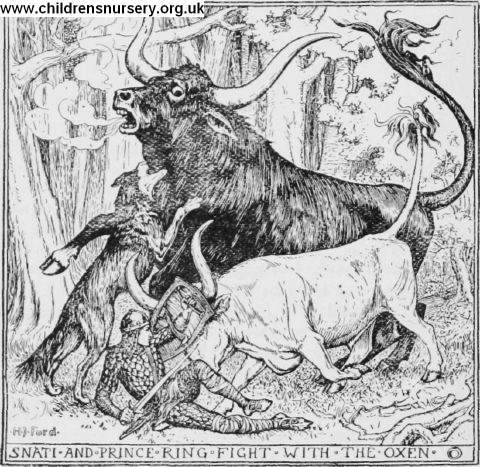 fear and trembling, and by the time Snati came to help him the ox had nearly got him under, but Snati was not slow in helping his master to kill it. Each of them then began to flay their own ox, but Ring was only half through by the time Snati had finished his. In the evening, after they had finished this task, the Prince thought himself unfit to carry all the horns and both the hides, so Snati told him to lay them all on his back until they got to the Palace gate. The Prince agreed, and laid everything on the Dog except the skin of the smaller ox, which he staggered along with himself. At the Palace gate he left everything tying, went before the King, and asked him to come that length with him, and there handed over to him the hides and horns of the oxen. The King was greatly sur­prised at his valour, and said he knew no one like him, and thanked him heartily for what he had done.